Although Granada is most famous for the Alhambra, flamenco and free tapas, there is also some great shopping to be found here and one of the great advantages of this city is its a manageable size. Whether you are looking for groceries, handbags, souvenirs, guitars, ceramics, spices or some good old fashioned high street-style retail therapy, you won’t have far to go. Small shops and businesses tend to open from 10.00-13.30 and 17.00-20.00 Monday to Friday and on Saturdays from 10.00-13.30. With a few exceptions they generally close on Sundays. Larger stores like Corte Inglés and Hipercor and supermarkets such as Alcampo, Mercadona, Carrefour and Super Sol open from 10.00-22.00 Monday to Saturday. Unlike in the UK most shops are closed on Sundays but there are some to be found selling basic supplies around the city including a convenience store on Plaza Nueva and De todo un poco on Calle San Antón which is open 24hrs and, as the name suggests, offers a little of everything. In the traditional Granadino handcrafts that you will find in the city, and around the province, you can see the various cultural influences from the Iberians to the Moors and the Christians. 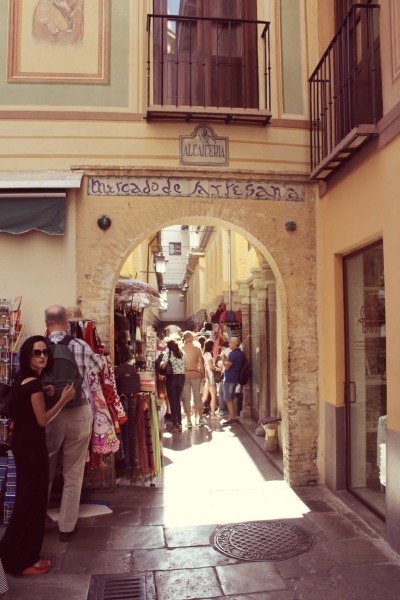 Albayzín – head here to haggle for Moroccan and Indian goods such as jewelry, sandals, clothes, bags, furniture, mirrors etc. Cheap and colourful is what you will find. Fajalauza Ceramica – if you are looking for pottery the most distinctive of all produced in the area is known as Fajalauza (see main image). It dates back to the 16th Century and is named after the medieval gate that led into the traditional potters quarter of Granada. You will find examples of this type of pottery in many places but if you are really serious you should head to the Fajalzauza Ceramica on Carreterra de Murcia and marked on the map. Alcaicería – located near the Cathedral the old silk market (pictured right), dating back to the Moors, is now a souvenir hunters paradise if you don’t mind getting tangled-up with tour groups. Head for the department store El Corte Inglés, which has entrances on Carrera de la Virgen and Acera del Daro, or the streets leading from Puerta Real – Reyes Catolicos, Recogidas, Calle Mesones and San Antón – for clothes, shoes, accessories and more. Major stores include Mango, Zara, H&M, Esprit, Claire’s Accessories and more. Supermarkets – Mercadona has a number of branches across Granada and is generally a good option if you are looking for variety, quality and value. The food hall at El Corte Inglés has a slightly more international offering. Carrefour has two main outlets which also include clothes, home and garden, electronics, toys and books etc. There is also a Carrefour Express on Avenida de Constitución. Mercado San Augustín – for all fresh produce, spices and food stands. Open 08.00-14.00 Monday to Saturday in Plaza de San Augustín. Plaza Larga in the Albayzín – fruit and veg stalls every weekday morning and a flower market on Saturdays. Bib Rambla – also known as Plaza de las Flores has numerous stalls selling plants and flowers. With lots of bars and restaurants lining the Plaza this is also a great spot to take a break and watch the world go by.